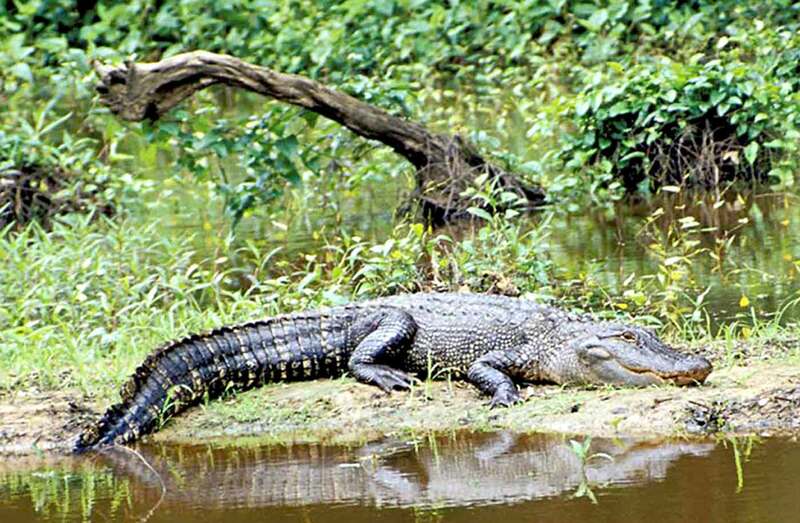 View Alligator hunting regulations for your county. Feeding Alligators: Except when engaged in hunting, it is against the law to intentionally feed a free-ranging alligator. Required License: Alligators may be taken under any resident or non-resident hunting license (except for a non-resident spring turkey license and a non-resident banded bird hunting license). Lawful Hunting Hours: One-half hour before sunrise to sunset. Between sunset and one-half hour before sunrise, no person shall set any baited line capable of taking an alligator, or remove an alligator from a line set. CITES Tags: Required in both “Core” and “Non-core” counties and are issued by the department. CITES (Convention on International Trade in Endangered Species) is an international agreement between governments to ensure that international trade in wild animals and plants does not threaten their survival. Sale of Alligators: Only lawfully harvested alligators may be sold and only to a licensed wholesale dealer or alligator farmer. It is unlawful to take an alligator by means of firearms from, in, on, across, or over public water. No person may employ more than ONE taking device at any time. Alligators may only be taken on private property/private water (non-core counties). Alligators may be taken from public waters (core counties only), however, the person and the taking device MUST be on private property. Hook and line (line set) must be secured on private property with a portion of the line above water. Minimum 300 lb. test line. Hook-bearing lines may not be placed prior to the open season and shall be removed no later than sunset on the last day of the season. Each line set shall be labeled with a plainly visible, permanent, and legibly marked gear tag that contains the full name and current address of the person who set the line and the hunting license number of the person who set the line. Line sets shall be inspected daily and alligators shall be killed, documented, and removed IMMEDIATELY upon discovery. Firearms (excluding rimfire), air guns, and arrow guns may only be used to hunt in non-core counties. Firearms (including rimfire), air guns, and arrow guns may be used to dispatch alligators legally captured on a taking device in any county. Gigs, hand-held snares (with integral locking mechanism), and lawful archery equipment (with barbed arrow), must have a float attached to the line. The float shall be no less than 6” X 6” X 8” or, if the float is spherical, no less than 8 inches in diameter. In non-core counties, the open season for alligators is Apr 1 – Jun 30. The bag limit in non-core counties is one alligator per person per license year. Alligators MAY NOT be taken during this season on any property where alligators were taken during the September season. Upon killing an alligator in a non-core county, a person must IMMEDIATELY affix a WRD to the alligator, which shall accompany the alligator until it is permanently tagged with a CITES tag. WITHIN 72 hours, complete the Non-Core Alligator Hide Tag Report (PDF) and mail it to TPWD, 4200 Smith School Road, Austin, TX 78744, along with a $21 hide tag fee (check or money order only). The department will mail a CITES tag to the hunter. Upon receipt, the tag must be permanently affixed to the alligator within 10 inches of the tip of the alligator’s tail. In listed counties (“core” counties), and on properties in other counties for which TPWD has issued CITES tags to the landowner, the open season for alligators is Sept. 10-30. “Core” counties are those counties constituting the prime historical habitat for the American alligator in Texas, where commercial hunting is viable and the department engages in significant biological monitoring of the resource and manages harvest through tag issuance to landowners. In core counties and on special properties, no person may hunt an alligator without possessing a valid CITES tag on their person prior to hunting an alligator. CITES tags in these counties are issued to landowners or landowners’ agents following a site inspection and evaluation by TPWD. CITES tags may only be used on the property they are allocated to, and cannot be transferred to other properties. For infor- mation about tag issuance and requirements, contact the Alligator Program at (409) 736-3625.